Specialist spider lift rental company MBS Access has purchased the first 30 metre hybrid Platform Basket 30T in the UK from local distributor Promax Access. The 30T hybrid – which features a lithium battery and Kubota diesel engine – has a five section straight telescopic boom with articulating jib giving a 30.3 metre maximum working height, 14.2 metre maximum outreach and 230kg capacity with fully automatic working envelope monitoring. When set-up with the outriggers in the narrow position, it has a maximum outreach of 18.5 metres over the front or rear of the machine with 136kg in the basket. The lift is exceptionally compact with a stowed width of just 890mm and 1.96 metre height – small enough to go through a single door – and length of 6.52 metres. For extra stability when travelling the tracks can be extended to 1,290mm wide. Given its performance the 30T is also lightweight at 4,250kg. 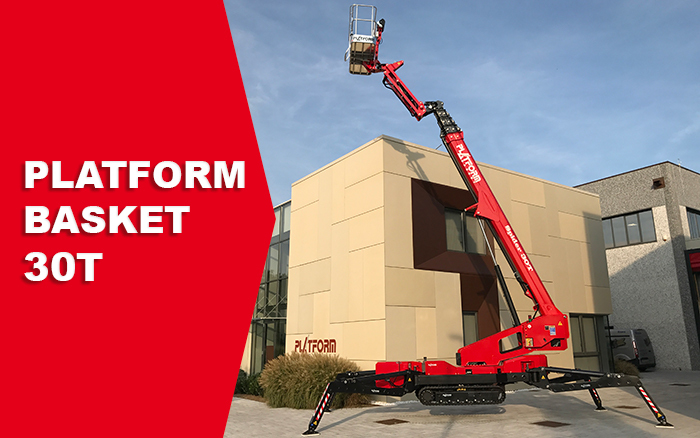 Standard features of the Platform Basket 30T include high lift outriggers – giving a maximum clearance of 1,215mm – which allow the spider lift to self-load/unload onto a truck. The variable position outriggers include asymmetric set-up, automatic levelling and stowage. The radio remote control has a two-speed drive, automatic recovery and machine self-diagnostics. The 1.8 by 0.8 metre quick detachable, lightweight basket has outlets for air, water and 110v/230v electrics. MBS Access has a fleet of more than 30 spider lifts ranging from 11 to 36 metres covering primarily the south east of England. Platform Basket UK distributor Promax Access – based in Barnsley, South Yorkshire – provides a full range of access solutions including tracked spider lift access platforms, Reedyk compact cranes and Road-Rail access platforms.